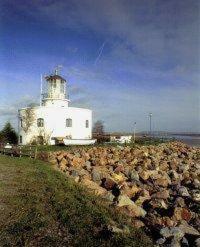 The West Usk Lighthouse was decommissioned in 1921 and was sold as a country retreat with over 50 acres of land. It was left derelict for a number of years afterwards until its conversion to a home in 1989. Today it offers comfortable accommodation and a room that has been made over by the TV programme 'The Hotel Inspector'.